My day start at 6:00AM with some prayers and meditation everyday. There is a thangka of Vajra kilaya I painted in 2009. Unlike the other thangkas I painted, this one is painted on Japanese silk. The silk specially for painting. Not very soft and smooth silk like you would imagine. It's more solid material. Its texture is much more rough compare to the usual thangka canvas. For me, who is used to paint on smoothly prepared canvas, the tip of the brush were jumping almost like riding a bicycle on unpaved bumpy road or maybe my preparation of the silk isn't good enough? 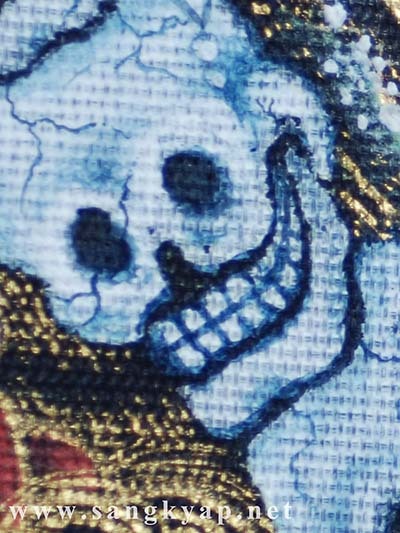 The good point is that the ink or gold paint flow very easily onto the silk. When there is base color, even the thiny lines are not too difficult. I have a pain in my neck and have been not able to do detail work for my Thangka. I'm reading, studying and checking things on the internet. While I was looking something about Thangka painting on the internet I found a familiar face. His name is Yonten who was playing the Thangka painter "Ga-ga" in the film "Thangka" which I wrote about in this blog recently. 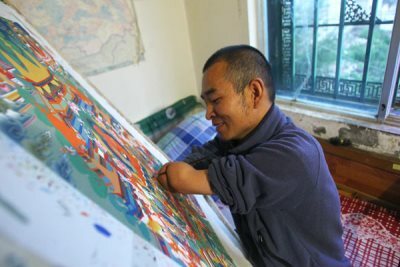 He is a Thangka painter not only in the film. Looking at his happy face on this image make me want to paint Thangka despite the pain in my neck. 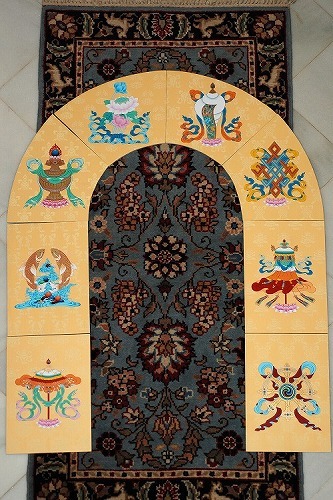 Indigo is one of the most important color for thangka painting. It's used for the sky, water, the shading on any kind of blue base color, the lining for the blue and green color,,etc. The indigo I received this time has the color more clear than the indigo from Japan or India and it's quite heavy in weight. I've found a blog about Moroccan artisan, "Artisans Of Morocco" and it seems we can find many different natural dyestuff in Morocco. Also the minerals such as Azrite or Malachite which are used for Thanka painting. 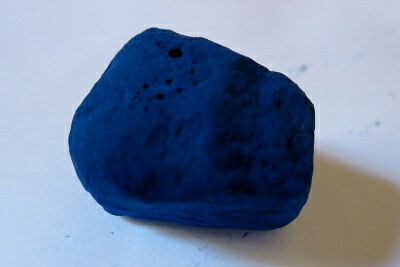 Maybe it is not bad idea to go there and check these natural pigments one day. I have no idea since when and how, but most of the images of the old entries were not displayed. Today's post is not about the progress of my paint. The title is "Thangka" ,,,,,of course. I've added a new link to "karma yeshe's thangkas". She is from Philippines, one of my friends from Tsering art school in Nepal. The new website which I have been thinking since long time ,,,specially "English version",,, has finally done! The new site include Tibetan traditional thangka and also some of Japanese style paints. he eight auspicious symbols in color. The drawings are from the carpet for Khentse Yangsi rinpoche's visit to Europe.